This is a VERY RARE original circa late 1940’s, 8 x 10 inch cheesecake portrait of of “Varga Girl” pin-up model, IRISH McCALLA showing off her voluptuous 39.5-24-38 inch curves while modeling a bikini at the beach for the local California Camera Club. She has inscribed on back. 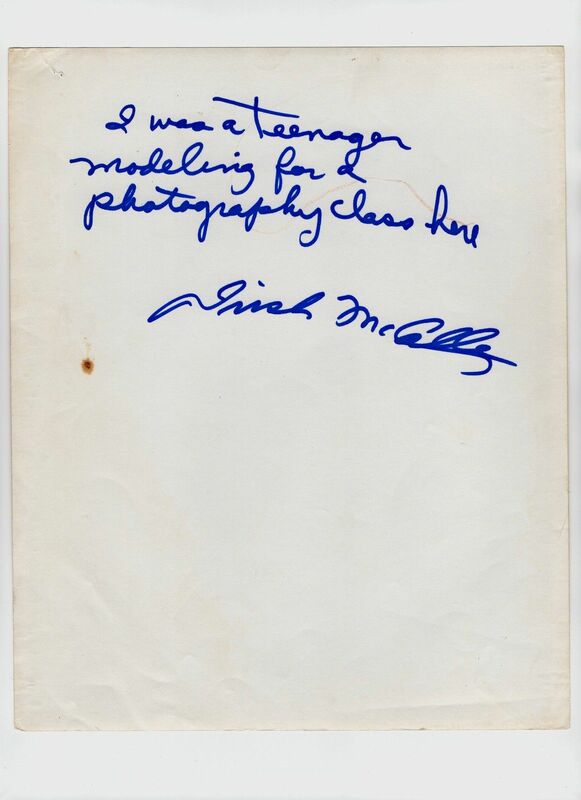 “I was a teenager modeling for a photography class here, Irish McCalla”. A lovely candid view of the bombshell blonde who was the inspiration of artist, Alberto Vargas. She later would gain minor screen fame in various “B” film productions and for her role in the television series, “Sheena, Queen of the Jungle”. The photo is in VERY GOOD to FINE condition with some corner creasing and surface wear from handling. There is also a pinhole at the top right corner. Rare Offering! I do combine shipping on multiple items. Shipping in Canada and the USA is 12.00. (I take my packaging and shipping very seriously, see my feedback) I will also ship Internationally, Tracked Packet-International for 40.00. Payment is due within 7 days of auction ending.